This is a Sensi Flex premium custom designed rod by Whaler's Cove Lodge guide, John Beath. It offers a special blend of lightweight composites that won't break. The 8 guides are premium stainless steel "Marine Grade" Alps guides. The rear and foregrips are "Easy Grip" foam. The reel seat is aluminum and offers a custom "Easy Lock" nut to make it easy to secure your reel. An aluminum gimball with cover lets the angler fish with or without the gimball. The rod is brilliant royal blue. This is a one piece 6-foot rod. Power: Medium, Action: Medium. Line rating: 30 to 100 The tip is super sensitive yet offers the power needed to fight big fish. The tip is sensitive to enable anglers to easily see subtle bites. This is by far the best halibut rod on the market for the most affordable price. Free Shipping to any U.S. State. Foreign shipping please inquire via contact form. Free Shipping to any U.S. State For foreign shipping please inquire cost via contact form. The Sensi Flex two piece premium downrigger/mooching rod is 9-feet long and offers 12 premium Alps stainless steel marine grade guides. This rod is a special blend of carbon fiber and fiberglass to give it an amazing sensitivity, flex and backbone to land any size salmon. The handle and foregrip is "Easy Grip" foam and slightly larger for a better economic grip, to enable an easier fish fight. The tip is super sensitive and will show the action of a flasher and slightest bite to let you know your bait or lure is working. Alaska guide, John Beath designed this rod and currently uses it at Whaler's Cove Lodge. This rod will even catch a whopper halibut. Two years ago one of his clients hooked a 150 pound halibut while trolling for salmon and landed it on this rod. Tight Line Trophy Braid is a premium 9 strand 80 pound test, high strength, low stretch, small diameter line. 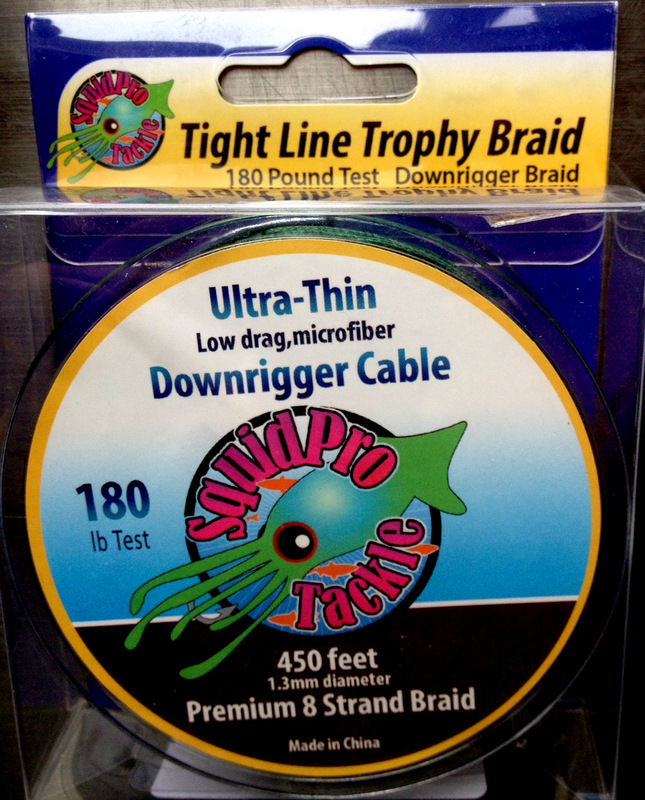 This line works for all sport fish including, halibut, lingcod, rockfish, tuna and sturgeon. 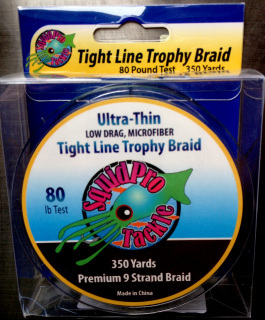 This braid is abrasion resistant and lays on the spool very well. 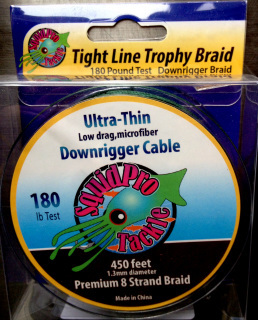 350 yard spool for just $24.95 free shipping.